consignment shop, while Flo and I were shopping. For the month of November, our family is embarking on a “media reduction” challenge. We already do not have cable TV or video game consoles, so mainly we are sending the kids’ tablets to Grandma’s house, and allowing fairly free access to the computers in the public areas of the house during the day, as long as things that need to get done, get done first. Darren and I don’t feel our computer usage is a major hindrance to family togetherness or productivity. However, we will monitor our usage, being mindful of our example. As parents know, children’s electronic devices often provide a sort of respite from the chaos, while everyone retreats to their respective corners to entertain themselves. This may not be ideal for fostering family unity and resourcefulness, but it is the situation for many. 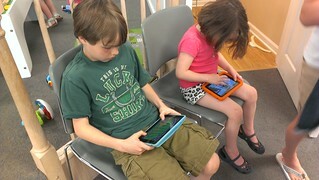 I’m sure there will be some subtle withdrawal from the relatively liberal usage of daily screen time they’ve enjoyed. And, I’m sure the onset of boredom will come quickly, but will be overcome with equal haste. I’m armed and ready to shield myself from the initial blast of resentment, and fully equipped to engage the displaced energy, even if it’s at the expense of my own momentary desires. We are not intending a full blown media black-out, simply reducing the opportunities for distraction, and increasing those for productiveness and creativity. As homeschoolers, time management is especially important, as we are often home all day, and it is easy for the kids to simply get sidetracked texting their friends, reading silly quotes on Facebook and watching less-than-educational YouTube videos. Our goal is not to shun the use of technology or discount the benefits of social media. It is simply to moderate their usage to allow for a balance of other pursuits. And by challenging ourselves for a month, our intent is to bring awareness to our media usage and provide the kids some contrast to draw upon in the future. I love a challenge. This should be interesting! I’ll be sure to keep some notes of our experience for a future update! Great idea! I wish I would have done this!